Heat the olive oil over medium heat in a large Dutch oven. Add the onion and cook until wilted, about 3 minutes. Add the garlic and cook until golden, about 6 minutes. Add the tomatoes and their juices plus 2 cups water to the pot, and bring all to a boil, stirring occasionally. 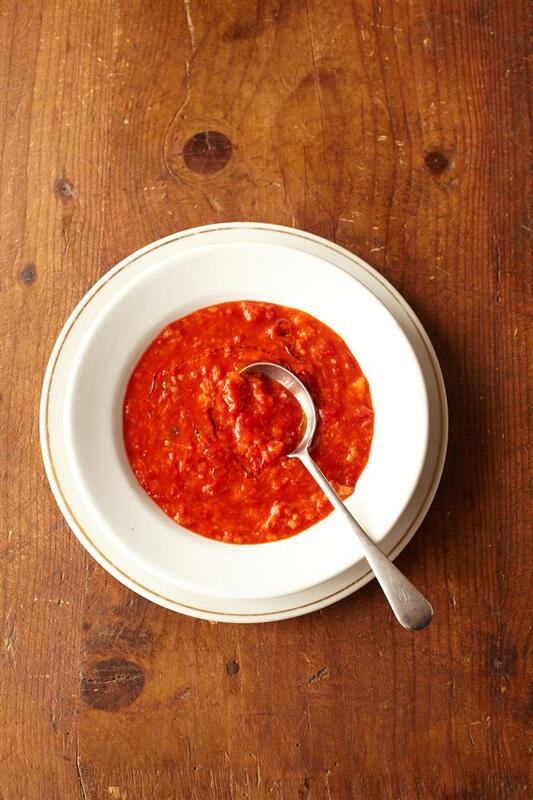 Once the tomatoes have boiled for 10 minutes, add the bread to the pot and return to a boil. Season with salt and pepper. Add the basil leaves, and adjust the level of heat to a simmer. Cook, uncovered, whisking occasionally to break up the pieces of bread, until the mixture is dense and silky, about 40 minutes. Fish out the garlic cloves and basil leaves. Season the soup to taste with additional salt and pepper if needed. Serve in warm bowls, drizzled with extra-virgin olive oil and shreds of fresh basil leaves, and sprinkled with the grated cheese.